Although there's no shortage of French restaurants in San Francisco, a down-to-earth neighborhood restaurant offering excellent French fare is hard to come by. Clémentine, taking its name from the bustling street on which it is located, is a true find. The charming Clement Street bistro is a refreshing change from the barrage of hip new restaurants in San Francisco that offer a glitzy atmosphere but little substance when it comes to the menu. Situated in the Richmond District, far from the glitz of downtown, Clémentine draws a diverse crowd reflecting the local neighborhood. The restaurant stands out among the dozens of Asian restaurants, noodle shops, bakeries, groceries and Irish bars. 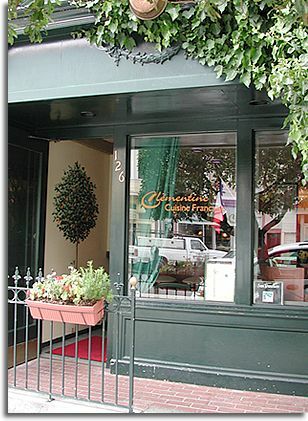 Although one might not expect to find French cuisine in a neighborhood known for its Asian ethnic foods, its location may actually contribute to Clementine's success: Nearby residents can enjoy a fine dining experience in the comfort of their own neighborhood rather than heading to one of the French establishments downtown, where parking is a hassle. And that's what the owners of Clémentine had in mind when they opened their restaurant in 1998. "We looked at several locations and just fell in love with this neighborhood. The people are very friendly, and in many ways it's a lot like a village," says Clémentine's manager and co-owner, Laurent Legendre (top left), who lives in the Richmond. 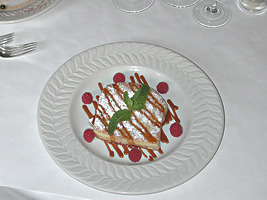 The restaurant features a neighborhood special prix fix menu that changes daily. "People like it because there's always something new," says Legendre. "I think we've been able to maintain a loyal following because we cater to the local clientele." Legendre, 32, is a Parisian native with many years of experience in the restaurant business. After coming to the United States in 1996, he worked at Postrio in San Francisco. 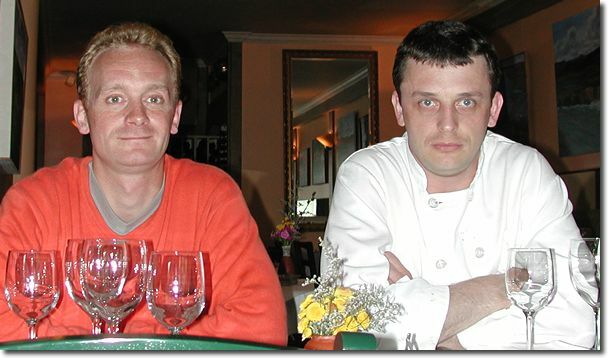 Legendre decided to open his own restaurant in 1998 and teamed up with chef and co-owner Didier Labbé (top right), whom he knew from the restaurant circuit in Paris. A native of Brittany, Labbé, 31, received his formal training in France and has been cooking for over 16 years. After attending culinary school, he trained with Gerard Vie of Les trois Marches in Versailles and later became chef at Restaurant Arpège in Paris. Since coming to the United States in 1994, Labbé has worked as chef at Raphael in New York and L'orangerie in Los Angeles. Labbé's classical French cooking ranges from simply prepared rustic French dishes to more inventive combinations. "I don't have a particular style like Provencal or anything," says Labbé. "I don't use recipes. I don't like that. 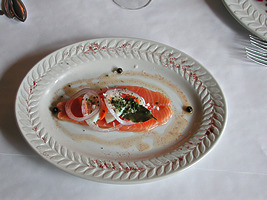 Some dishes are bistro-type and other dishes, like the specials, depend on the season." Traditional bistro favorites include beef bourguignon with fresh linguini pasta and parsley, and tender rib-eye steak in a red-wine sauce served with a pile of crispy French fries. Sautéed tilapia with red beet risotto and chive beurre blanc is a specialty of Labbé's native Brittany. The seasonal menu, which changes weekly, also features more sophisticated dishes like filet of lamb with thyme, cooked to perfection and served with porcini mushroom raviolis and truffle oil; and duck confit with lean slices of duck breast served with lentils and lardon over arugula salad. Appetizers, such as mussels steamed in a creamy Noilly Prat sauce with fresh tarragon and marinated salmon with juniper berries and laurel (right), are exceptional. Artichoke heart salad with slender green beans and balsamic reduction is a perfect seasonal dish. Splendid desserts, like French toast with caramel sauce (below left) and rich hazelnut ice cream, and the ever-popular Clémentine Colonel featuring tangerine sorbet with a shot of vodka served in an ice-cool glass, top off a sumptuous mea l. Clémentine also has an excellent rotating wine list with a wide selection of French and California wines. It's no wonder that Clémentine has created a niche for itself, successfully catering to the locals. The 49-seat dining room is always packed, thanks to a loyal customer base of local residents from the Richmond, Lake District, Laurel Village and the Presidio. And because of its proximity to the Presidio, which has easy access to the Golden Gate Bridge, Clémentine also draws customers from Marin and Sausalito, who often stop in during their trips to the City. Clémentine's traditional décor is offset by a gleaming full bar with gold mirrors and open windows, creating an airy yet intimate space, with country tables, comfortable French chairs and cushioned banquettes. The French-speaking staff is friendly, knowledgeable and extremely efficient. Unlike trendier restaurants, Clémentine, which offers a warm atmosphere, good service and excellent food, has earned its place as a destination spot.